Influencer marketing has established a place in integrated communications strategies, and for good reason. Join us for the first Professional Development lunch of the year, as we hear from Joshua Esnard, founder of The Cut Buddy which was recently featured on Shark Tank, winning the likes of business mogul Daymond John. Through third-party word-of-mouth – notably through YouTube – Joshua was able to take his business from a garage to national television. Joshua will discuss the important role influencer marketing played in driving awareness for The Cut Buddy brand, while also discussing the inspiration behind his creation, his road to Shark Tank, and what he prioritized in bringing this brand to life. Need to find your PRSA membership number? Login here. A native of the small Caribbean island of St. Lucia, Joshua Esnard is a classic example of the American Dream. Since immigrating as a young child, Joshua Esnard has grown from humble beginnings to a wildly successful entrepreneur with over $1 million in global product sales in less than two years of business operation. 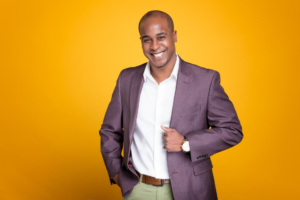 After being featured in Forbes, GQ, and Black Enterprise and landing a deal with Daymond John on Shark Tank, Esnard has become a highly sought after entrepreneurial, business, and motivational speaker and consultant. As an experienced and entertaining business speaker with over ten years of business and motivational speaking and consulting expertise, Joshua shares the strategies that helped him go from an immigrant with a dream to an entrepreneurial success in the United States. As the Inventor and CEO of The Cut Buddy, in less than two years Joshua Esnard has seen his company transform from a garage business to a viral success and industry leader in the beauty sector with a multi-million dollar valuation. Joshua teaches audience members how to apply his successful methods to all types of businesses. He shares his successful strategies for entrepreneurs and businesses alike with his expertise and experience in critical business functionings including: the invention and patent process, team building, strategic production and distribution, market research and development, intellectual property enforcement, and innovative marketing strategies to help your product or business go viral. As a motivational speaker, Joshua’s immigrant success story of childhood wonderment, innovation, determination, sacrifice, and perseverance as well as the entertaining and personable way he communicates it will inspire and motivate any audience.